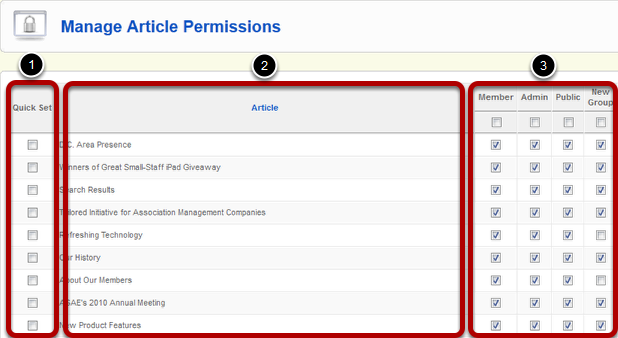 This will show you the steps involved in adjusting article permissions. Article permissions (along with category and menu item permissions) dictate which users are able to view the content in your site. From the Article Manager menu, click on an article. Within the article, use the Group Access permissions on the righthand side of the screen to assign permissions to each of the applicable groups. Article: This is a list of all articles by title. If you checked an article (or articles) from the list, only the checked articles will appear here. The boxes on the right indicate which groups are able to view each article - if the box is checked, the group has permission.